I made this gorgeous looking cake a month ago for a dear friend’s birthday. With my busy schedule and work, now only getting time to post it. I stuck to my favorite white cake recipe and used various shades of peach and pink to create ombre effect of pastels. There are few things which I have been meaning to do since I started baking and using food coloring in ‘dots’ to get the desired color is one of them. I added chopped strawberries and pineapples as filling between layers along with whipped cream. 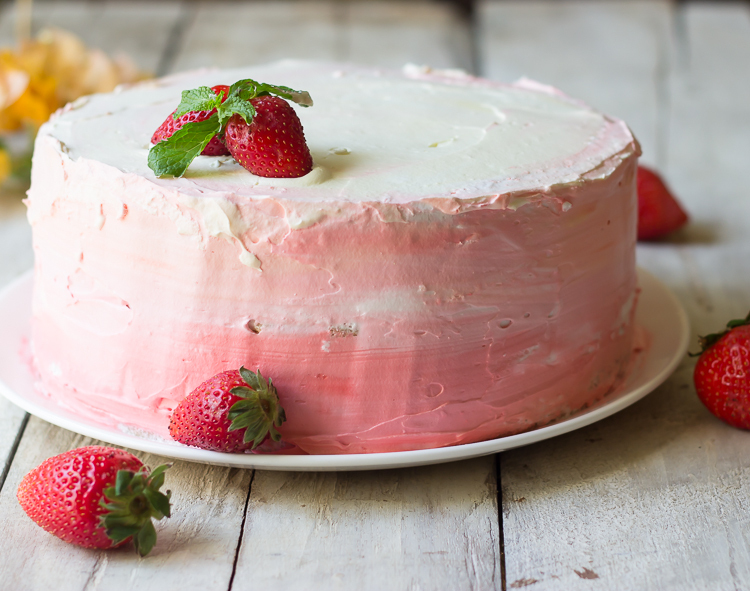 Over to the Strawberry Pineapple Ombre Cake. 1. Pre-heat oven to 170°C. Grease and line an 8 inch round pan. 2. In a large bowl, combine together flour, sugar, baking powder, salt and baking soda. In a separate small bowl, mix curd or buttermilk, oil, vinegar, vanilla extract and apple sauce. 3. Stir the wet ingredients into the dry ingredients bowl until just mixed. I added another teaspoon of curd to adjust the consistency. Pour the batter into prepared pan. Bake for 25 minutes or till the tooth pick inserted near the centre comes out clean. Cool the cake completely in the pan before de-moulding. Freeze the layer till further use. Bake 2 more layers. 4. Assemble and decorate as per your choice. This recipe makes 1 layer. Repeat this process to get 3 layers. Add food coloring to whipped cream in any shade you want and decorate as per your whim.